The Tootsies story began in 1992 when Claude Bohemier and Greg Taylor acted on their vision for a new kind of shoe store - a uniquely Canadian store offering quality family footwear and factory-direct pricing. With a combined 50 years of expertise - experience and influence in the shoe industry - the entrepreneurial pair negotiated aggressive pricing for their new Brantford - Ontario location. In spite of opening their doors on the cusp of a recession - what would soon become the flagship store opened to excited throngs of shoppers eager to enjoy the incredible value and quality advertised by the new retail outlet. Today - Tootises has grown to 18 stores and over 100 employees. Children from both families have since stepped forward to carry on the work of the founders and this all-Canadian owned and operated retailer is a source of pride for the growing family team. The clarity of their Canadian focus shows in Tootsies’ marketing strategies - it’s branding and corporate identity. In addition to the growing number of retail locations - you can also find Tootsies in key Ontario factory outlet malls including Windsor Crossing - St. Jacobs Factory Outlet Mall - Canada One Place in Niagara Falls - Cookstown Manufacturer’s Outlet Mall and Southworks Outlet Mall in Cambridge. 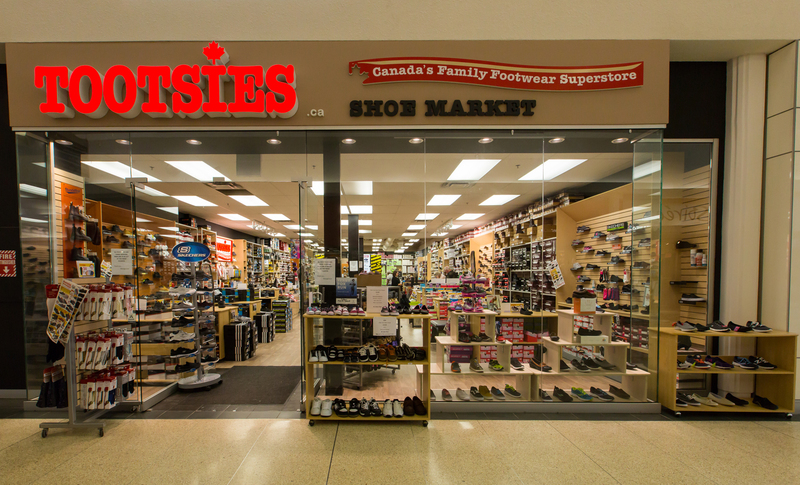 By keeping their marketing strategies current with the ever changing Canadian market - a new trade name - Tootsies Family Shoe Market - was added in 1999. Also recently added into the corporate family is our current trade name - Tootsies Shoe Market. Tootsies Shoe Markets continues to grow and evolve but the goal will always be to provide affordable footwear for the entire family. From slippers to fashion shoes - walking shoes to technical running shoes - foot care products to winter boots - the brands offered in all Tootsies locations offer something for everyone. Tootsies’ extensive selection includes many name brands. Come visit us at one of our sixteen convenient locations for trusted brands such as Tender Tootsies - Lullabies - Hey Toots! - Barefoot Science - Sof Sole - Columbia - Brooks - Naturalizer - Deerstags - Toe Warmers - Aerosoles - Wolverine - Reebok - Crocs - Dockers and Kodiak among many others to ensure that each family member’s footwear needs are met.